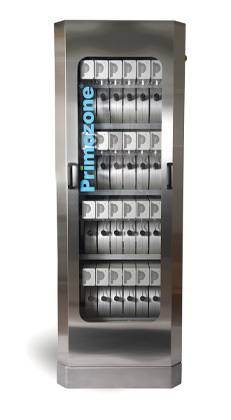 The Primozone® GM-series is a series of high-performance ozone generators based on the redefining Primozone ozone technology. An ozone technology that is built around on the unique and patented Primozone aluminum ozone reactor. Whatever size ozone generator you need there is no need to compromise on any features. All the Primozone ozone generators are based on the same redefining ozone technology that enables the worlds most reliable ozone production. The GM-series offer eight standard size ozone generators and a GM-on demand alternative. The GM-on demand is built-to-fit ozone generators that are based on the Primozone ozone technology and scaled according to customer needs. The above Primozone GM48 ozone generator measures 2040x980x840 mm and produces 2.7 kg of ozone with a concentration of 20 wt%.